Clet Abraham’s street art is frequently shown by the alteration of common street signs throughout Florence. But his anarchic acts don’t stop with a few signs (remember, he put the nose on the Tower of San Niccolò). 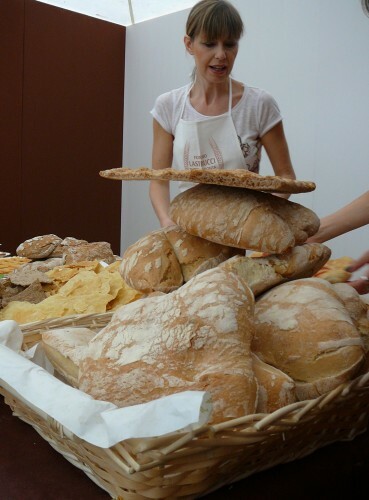 In a town mired in a 500-year-old artistic patrimony, Clet continues to bemuse residents and visitors alike. 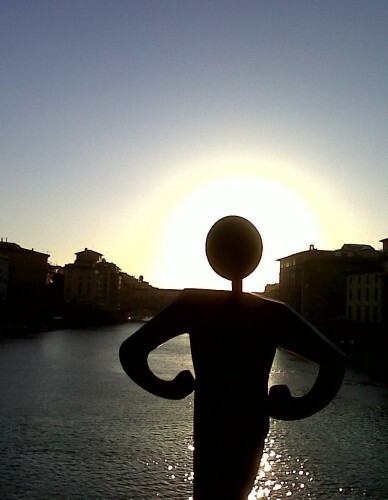 Now the Common Man is back on Ponte alle Grazie. 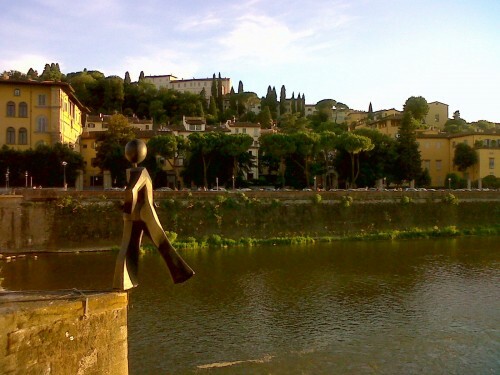 One night last week, Clet and a couple of friends re-installed Common Man, a life-size black fiberglass statue, without permission, on Ponte alle Grazie, so that once again he is walking off into the future over the Arno River. Make sure you visit him before the powers-that-be mandate his removal … again. 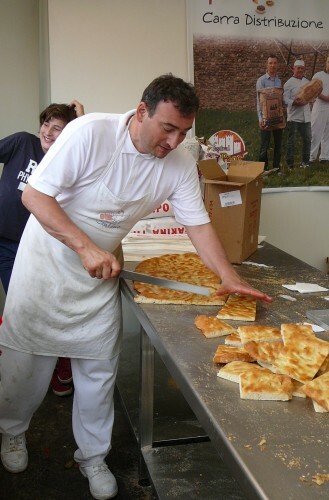 Common Man (Uomo Comune) bears a striking resemblance to the black cut-out figure on Clet’s altered street signs. The bridge-jumping statue, which from a distance looks like it is made of heavy iron, is enjoyed by all (except perhaps the die-hard cultural naysayers) with photographs going viral on the internet. 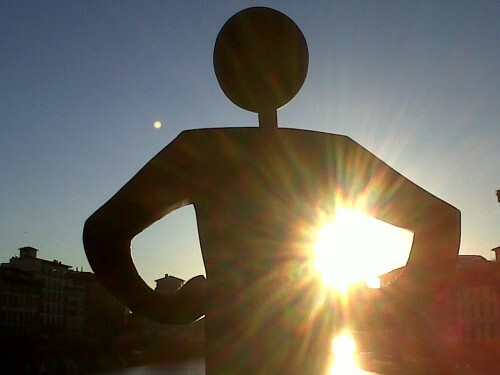 In 2011, Common Man was removed after seven days later city officials, taking weeks and a Facebook campaign to get the statue back into Clet’s possession. Tuscan Traveler looks forward to whatever Clet thinks up next to surprise and delight Florence. INVISIBLE WOMEN, a documentary based on the book Invisible Women: Forgotten Artists of Florence, written by American Jane Fortune (The Florentine Press, 2009) won an Emmy award on June 1, 2013, as the Best Documentary in the Cultural/Historical Program category by the National Academy of Television Arts and Sciences. The documentary, produced by WFYI Productions of Indianapolis, was recently aired on American public television (PBS). 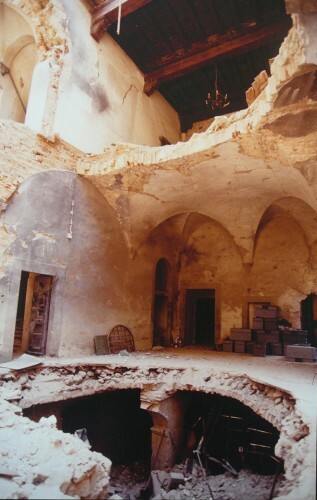 “Efforts to safeguard works of art are obviously directed to our cultural heritage in general. 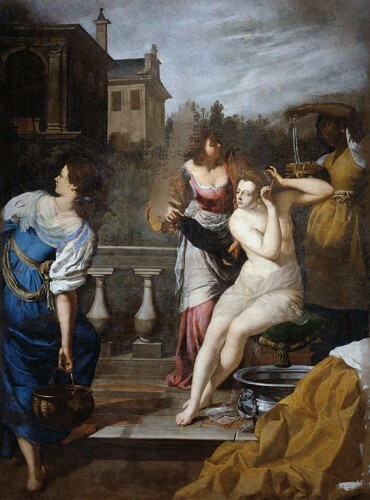 What I think we are doing on many fronts is dedicating supplementary attention to works of art by women, through initiatives like restoration and presentation to the public, placing an emphasis on the personalities of these women artists,” said Cristina Acidini, Superintendent of Florence’s Historic and Artistic Ethno-Anthropologic Patrimony and the Polo Museale. 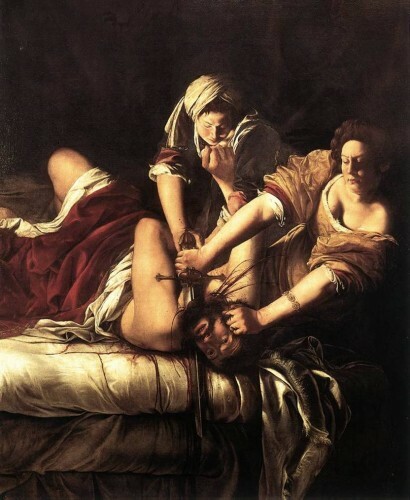 Suor Plautilla Nelli, Artemisia Gentileschi, Elisabetta Siriani, Irene Duclos Parenti, Elizabeth Chaplin, Lavinia Fontana—the search for women artists in Florence spans hundreds of years and leads the art lover through the halls of the city’s museums, where a sprinkling of representative works gives incentive to further investigation. The whirlwind tourist knows nothing of them, while the art-loving resident lucky enough to happen upon an occasional exhibit aimed at unearthing the city’s hidden cultural patrimony may only vaguely remember their names. 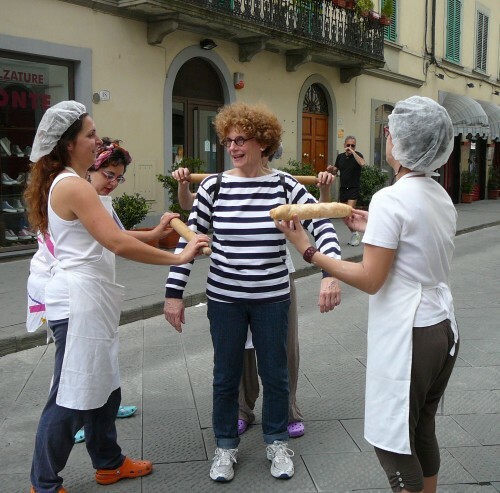 The documentary Invisible Women will have its Italian premiere at Florence’s Odeon Cinema on Tuesday, June 25 at 7pm. Tickets cost 6 euro, with proceeds going to the Advancing Women Artists Foundation which restores and safeguards works of art by women. 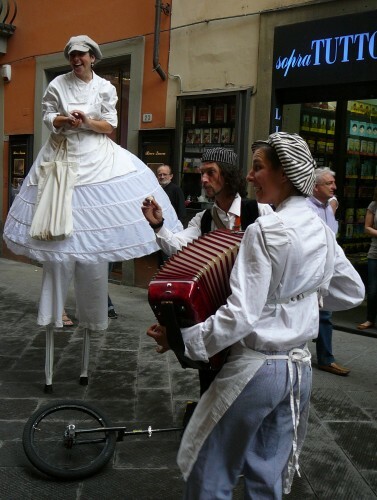 The Odeon Cinema is a partner in the event, evidence of its ongoing commitment to culture in the city of Florence and of its international nature. For information on the evening visit the websites of The Florentine (www.theflorentine.net) and the Odeon Cinema (www.odeonfirenze.com). 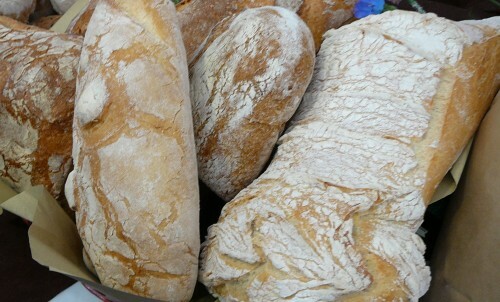 See the Facebook page. 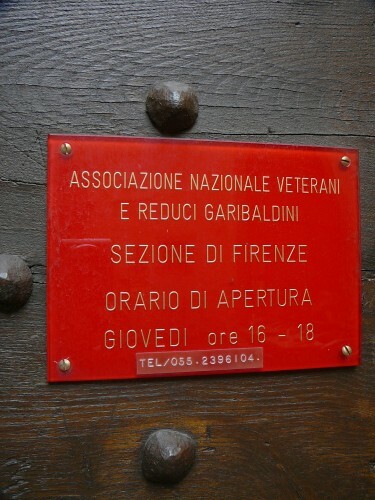 One of the most interesting, but least visited museums, in Florence is the Garibaldi Museum, maintained by the Associazione Nazionale Veterani e Reduci Garibaldini, in the 10th century tower, Torre della Castangna which stands in Piazza San Martino, on the corner of via Dante Alighieri. It has in its collection a portrait by one of Florence’s most talented artists, working at the dawn of the 20th century, Elisabeth Chaplin. 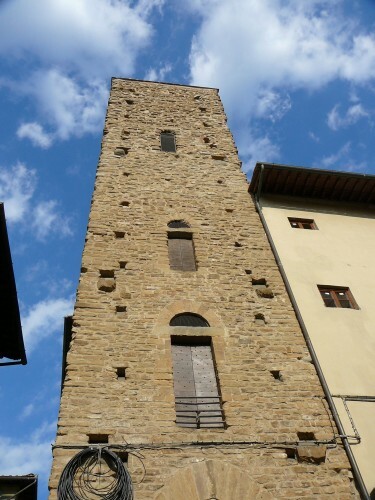 The Torre della Castagna is interesting in its own right, being one of the least altered medieval towers in Florence. In 1038, the tower was given by Emperor Corrado II to the Benedictine monks of the adjacent Badia Fiorentina in order to help with the monastery’s defenses. 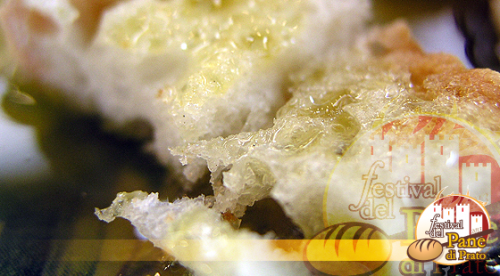 In 1282 the tower became the meeting place of the Priori delle Arti, the governing body of the Florentine Republic. 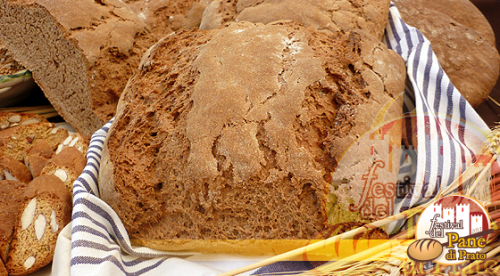 The name of the tower came from the fact that the members of the Priori used chestnuts (castagne) to cast their votes. Today, the tower houses a collection of artifacts having to do with Giuseppe Garibaldi, a central figure in the Italian Risorgimento, since he personally commanded and fought in many military campaigns that led eventually to the formation of a unified Italy. 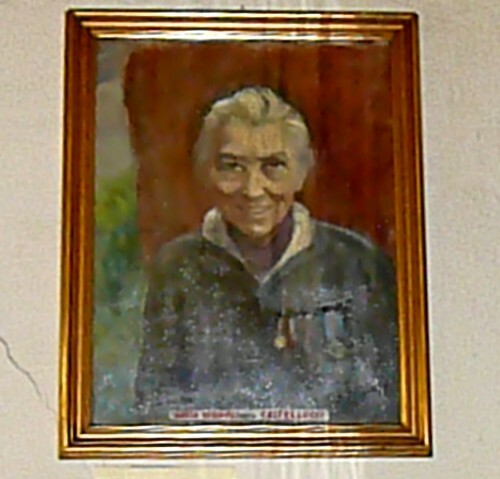 Among the collection is a portrait of Anita Vignoli (née Castellucci) painted by Elisabeth Chaplin. Anita Castellucci, named by her father after Garibaldi’s beloved Brazilian wife Ana Ribeiro da Silva (commonly known as “Anita”), who fought with Garibaldi. 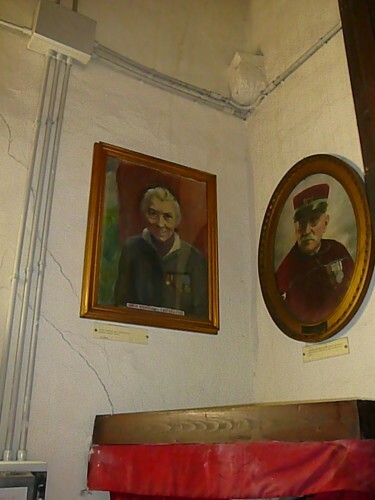 Her Vignoli husband worked to carry on Garibaldi’s legacy into the 20th century. Anita Vignoli is wearing her father’s medals. Chaplin’s visits to the Uffizi Museum were decisive. She learned from copying the classics. From 1905-8, she painted her first large canvases and in 1910 her Ritratto di Famiglia (Family Portrait) for the Florence Society of Fine Arts won her a gold medal. In 1916 she moved with her family to Rome, where she would live until 1922. 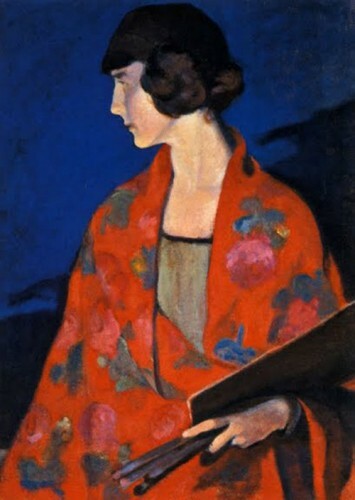 She participated in the Venice Biennale in 1914 and in the Paris Salon in 1922 and thereafter. In the 1930’s Chaplin produced numerous frescoes and murals. In 1937 she won a gold medal at the International Exhibition in Paris and in 1939 she was given the French Legion of Honor. 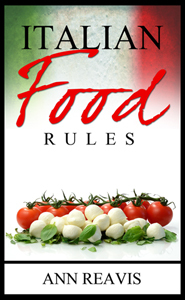 She returned to Italy after World War II. Chaplin donated her entire body of works to Florence. Fifteen of her paintings are on show at Palazzo Pitti’s Modern Art Gallery, while almost 700 (paintings and sketches) are in storage. Why are so many masterpieces by extraordinary women artists hidden from the public eye and from the enjoyment of visitors? See a small part of the story at the Odeon Cinema on June 25. 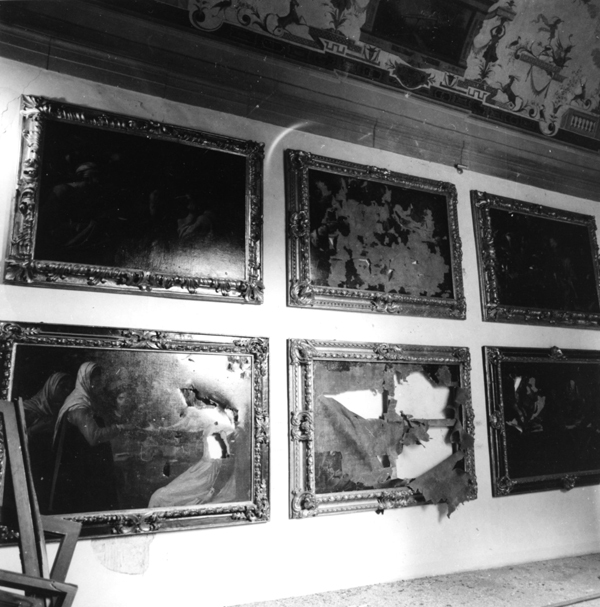 Three paintings were lost, while in total about 200 were damaged (150 paintings and 50 sculptures), between those exposed in the museum, those in the hallway of the Vasari Corridor, and those in storage. 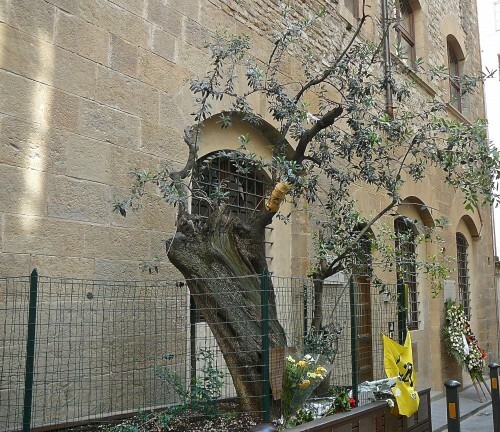 The tree has not weathered the years in the alley behind the Uffizi well. It is now bandaged and bare. 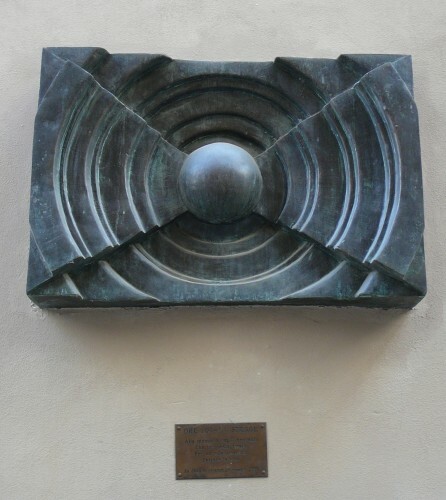 In 2008, the City of Florence placed a bronze piece depicting the blast was placed on the wall across from the Accademia. 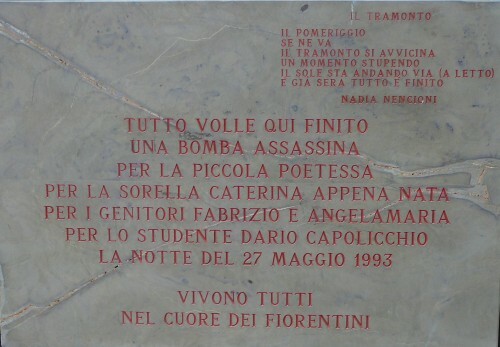 In 2011, President Napolitano came to commemorate a plaque on the wall of the Accademia dei Georgofili with the names of the victims inscribed. 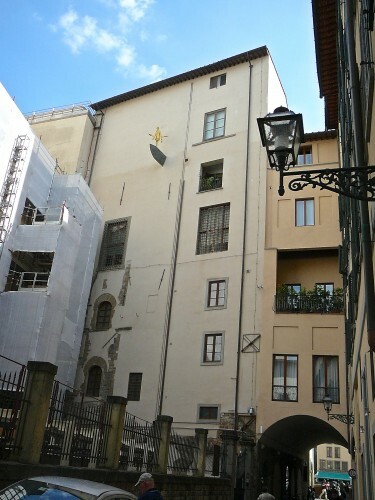 This year on May 26, the Uffizi Gallery, together with the Friends of Florence, unveiled a specially commissioned statue, which is placed some 20 meters above ground on the wall of the Uffizi Gallery facing Via dei Georgofili. 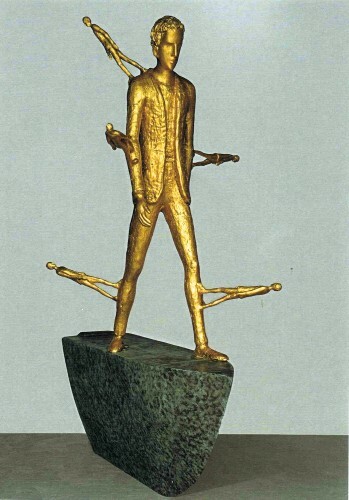 Made by Tuscan artist Roberto Barni, the 2-meter tall statue in bronze is entitled “I Passi d’Oro” (The Golden Strides). It was presented to the public in the Salone de’ Cinquecento of the Palazzo Vecchio by president of the Italian Senate, Pietro Grasso, with members of the Association of Relatives of the Victims of via dei Georgofili in attendance. 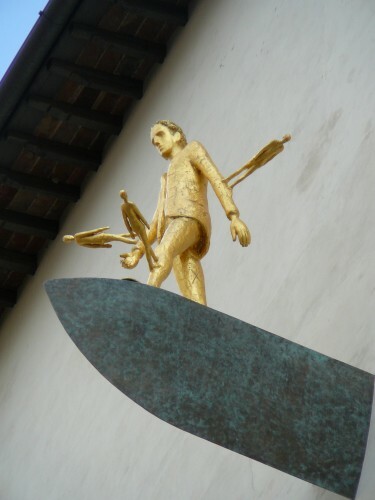 The six-foot statue of bronze, covered in gold leaf, depicts a striding golden figure of a man with five small attached figures (representing each of the victims) on a blade of stone. See the video of the unveiling in situ. Perhaps only the powers that be of the Uffizi Gallery can explain why the impressive six-foot sculpture by Barni is placed so high on the museum’s exterior wall that it can barely be seen. Is this the age-old problem that Florence has displaying modern art where people can actually see it or is it the difficulty of attaching a heavy bronze to the medieval Torre dei Pulci, where there was the most loss of life, or is there some other reason? I, for one, would support the repositioning of I Passi d’Oro.